The banana tree, or Musa x paradisiacal, grows in humid, tropical locales and today is the 4th largest fruit crop in the world, reports Purdue University. It originated in the Indo-Malaysian region, which included Northern Australia, and was first carried to Europe around the 10th century A.D.
Green bananas take longer to ripen and are often referred to as plantains. Portuguese explorers transported the plant to South America in the 1500s. Annual world production is estimated at 28 million tons, with 65 percent of bananas hailing from South America; 27 percent from Southeast Asia; and 7 percent from Africa. Brazil is the leading grower in South America, producing 3 million tons each year, while Colombia and Ecuador are the leading exporters of the fruit. Edible bananas thrive only in a region best explained as roughly between latitudes 30°N and 30°S across the globe. They require a mean temperature of 80 F and at least 4 inches of rainfall monthly. The trees suffer if a dry season extends past 3 months. Banana trees grow one leaf monthly during the winter and 4 each month throughout the summer season. A bud may decline to emerge from the stem if low temperatures decide to appear precisely at flowering time. 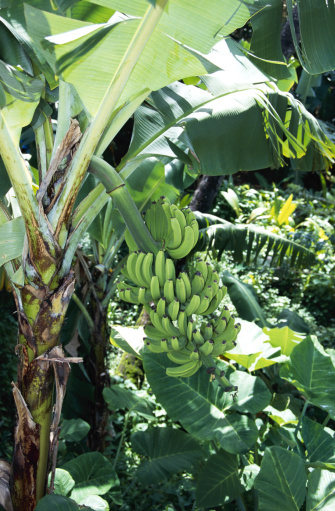 Banana trees do not enjoy wind, as it tends to shred their leaves and interfere with the metabolism of the plants. The trees should be semi-sheltered to provide protection from cold and wind. 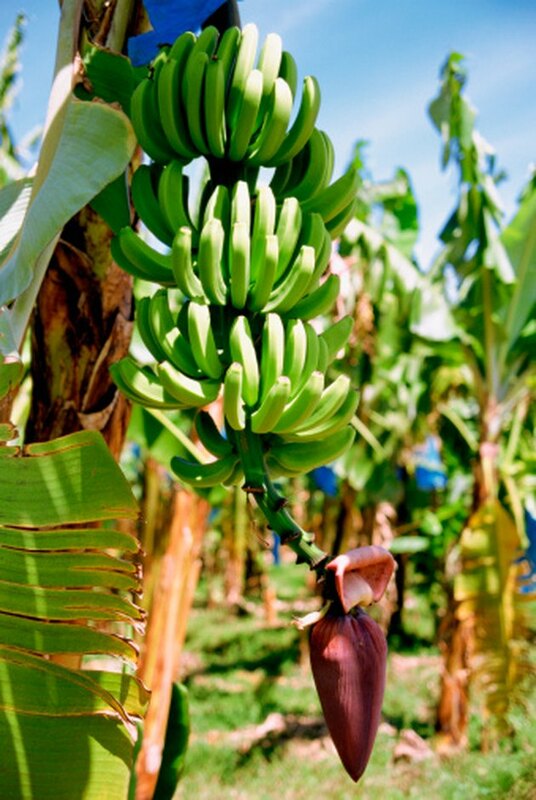 Banana trees tolerate a variety of soils, including loam, rocky sand, marl, red laterite, volcanic ash, sandy clay, and heavy clay, but the earth must be well-drained. The trees thrive in acidic soil, yet lime should be applied if the pH level falls below 5.0. A pest known as a nematode exists as the most significant pestilence problem afflicting banana trees worldwide. In Puerto Rico alone, 22 different kinds of nematodes attack the plant, boring into it, causing discoloration and providing entry points for a variety of fungi. Application of nematicides help to control the pests. The black weevil, Cosmopolites sordidus, also called a banana stalk borer or banana weevil borer, is the second most troublesome pest for bananas. How Long Does it Take for a Banana Flower to Become a Fruit? How Does a Citrus Tree Reproduce?